You may have noticed our normally scheduled Friday Coffee Talk post never appeared last week. 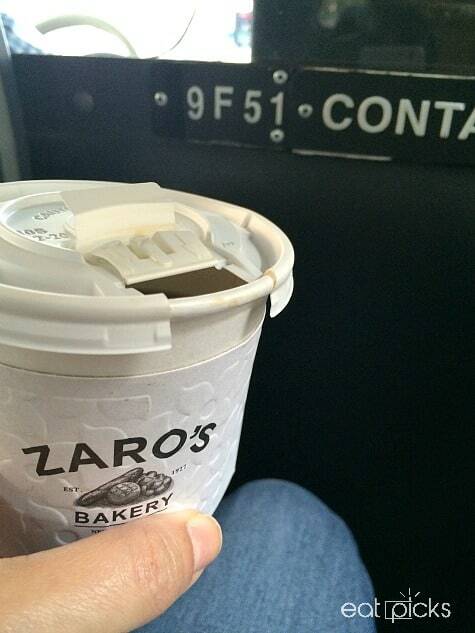 Well, there is good reason for that and I will tell you, but first I want to share about the photo above of my Zaro’s Coffee in a cab. Zaro’s is one of my favorite stops at NYC Penn Station. Their marble bagels are awesome and the coffee isn’t too shabby either. My train arrived early and I was not very hungry, so I didn’t order a bagel, but coffee? Oh, yes- I needed that. As I walked toward the street to catch a cab, a woman stopped me and in a very quiet voice, asked if I could buy her breakfast. She talked so fast it wasn’t registering what she was saying at first. I’m sure my confused expression was evident, because she then repeated herself, a bit slower this time. She looked at my coffee cup and I looked in her eyes and said “yes. What would you like?” A toasted bagel with jam and coffee, light and sweet was her reply. So, back to Zaro’s we went and placed her order. Once I paid, I turned to her and said have a nice day and she said Thank you. Sometimes we all tend to turn a deaf ear to those who are struggling and that makes me somewhat sad. If you have an opportunity to help someone today, do it, and do it out of kindness. So, why was our post missing last week? I was in a bad car accident. A drunk driver totaled my new car and possibly the other car they hit as well. I’m still bruised and sore. It’s been a hell of a week. I will share more about this, but for now this is all I can say about it. I’m extremely lucky. An inch in either direction and I’m not sure I would be typing this to you now. Life. It’s short. Enjoy it. And most of all- be kind to each other. Wow — you know how to take your readers on a roller coaster ride! What a sweet story about breakfast . . . I think, far too often, when I’m in NYC, I put on the blinders that come with growing up outside of the city, and I, simply, don’t see many of the homeless, even when they’re right in front of me. As far as the car . . . wow, I’m glad you’re ok. That’s so very scary! I’ve been in two accidents in my truck – both times, I was rear-ended. Both times, everyone just walked away. I hope the bruising & aching leave shortly. And please, keep us updated as to how you’re doing. I agree- sometimes we are afraid to make eye contact because it’s uncomfortable- I freely admit that I am in this camp most days, so when I am aware of it, I try to change- and this woman kind of made me snap into that focus. The car…yes…it can be replaced. I am very lucky. Someone upstairs was certainly looking after me that night. Thank you for your kindness…I will definitely keep you posted- lots to share on this one.